Gorgeous One-of a Kind Adobe Mid-Mod Classic with Charming ABQ vibe. Welcome to our spacious lovely adobe abode! This home will charm you at every turn. Wonderful brick floors take you from room to room. Stunning Copper Fireplace is the center and soul of the house with a beautiful baby grand piano! Thick adobe walls make the home quiet and insulated. The updated kitchen and baths are luxurious and comfortable. Large rooms with lots of space for gathering together. Centrally located between UNM and the heart of Nob Hill. Near Whole Foods, Sprouts, great restaurants, parks, Kirkland, transit, grocery, access to both I-40 and I-25. Lovely new kitchen/baths, skylights, patio, fully stocked kitchen. Perfect for reunions, couples, solo adventurers, business travelers, families (with kids), and big-ish groups. New HVAC and refrigerated air units keep you warm in the winter and cool in the summer. The master suite has a huge master closet, private bath with double sinks, a dresser and nightstands and opens with french doors to a cozy office area if you must work. The queen room has a large closet, nightstands, and corner windows. The twin room has two single beds that can push together to make a king. The room has a large closet, big window, a dresser and a nightstand. The fireplace room is in the center of the house, with a wall of glass to the patio just beyond the circular brick and copper fireplace. The baby grand in the corner loves to be played. The dining room and living room open to the kitchen and copper fireplace room making the spaces perfect for gatherings or for finding a nook to take your book. The kitchen is fully stocked for cooking. We keep the separate private casita for an occasional stay, but the spaces are totally separate, and we'll let you know if anyone will be there. Happy to meet you if we're there, or let you have your privacy. I split time between New Mexico and Colorado and would love to share my home with you. It is such a unique property that I fell in love with immediately and hope you do too! When I visit a new place, I want to stay somewhere that reflects what is unique to that area. 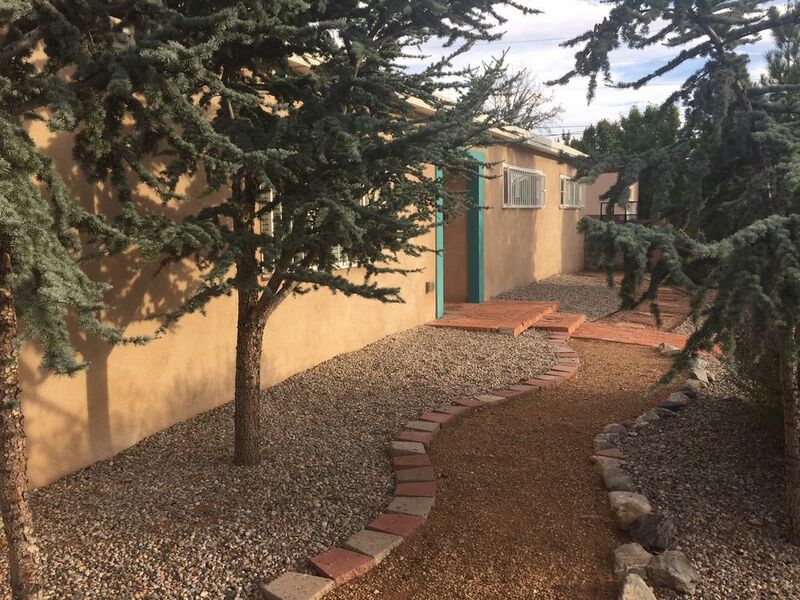 This property was originally built by a UNM professor and recently remodeled. The thick adobe walls, brick floors and copper fireplace all feel like old world New Mexico, but the new kitchen/baths, windows, fixtures and paint make you feel like you are in a resort hacienda. The convenient location and architecturally distinct features make this THE place to make beautiful memories in enchanted Albuquerque! Luxury bedding and towels provided. Fireplace in Living room and Copper Fireplace in Center room. Stainless with ice maker and water dispenser in door. Stainless. Gas Burners. Stainless hood. Basics...cooking oil, salt pepper, coffee, tea, basic spices, plastic wrap and foil, tupper ware. Beautifully redone kitchen with granite and stainless. Four kitchen barstools at counter. Kitchen opens to dining and living room with open view to copper fireplace. Fully stocked! Table for 6 with leaf to add two more. Owner maintains separate casita for occasional visits, but the spaces are very separate and you will be aware if any of us are there. Our family friend lives very nearby and will be at the ready for any issues that arise that require a local contact. the house was perfect for what we needed on our first trip to NM. it even has a play structure that our children entertained themselves with for hours! we loved the smart tv after our long day explorations. we used the kitchen to cook most nights and everything we need (utensils/pots/pans) were readily available. very relaxing and homey! we will definitely return. Our family of 4 spent 4 nights here. It was conveniently located in a nice neighborhood. The house was very clean and spacious inside. Kitchen and baths were nicely stocked for us. The kids already want to come back to New Mexico and we would definitely stay here again! This house was amazing, lots of room to spread out, nice living room and great room. Bedrooms are separate at one end of the house, which afforded us all to have our privacy. House was clean, we had no issues. The area is one of the nicer areas in ABQ. It is within walking distance of a really nice park. We took walks every day we were there. ABQ has really good hiking within 30 mins and skiing within 90 mins. I highly recommend this place to stay if you are visiting ABQ. Loved this property! Open and spacious with everything we needed in a central location. The house was clean and comfortable; worked perfectly for our group as we enjoyed Balloon Fiesta activities. Check in and out was a breeze and Amie was very responsive with any questions. Would definitely stay here again! One block south is a sweet little pocket park where neighbors walk, kick a soccer ball around, or just pass by. One block to the north is Altura Park. This is a larger park with beautiful trees and gorgeous homes. Don't miss the Taj Mahal on Carlisle for a wonderful Indian Buffet. Just south of you on Central are all the great ABQ, Nob Hill, Route 66, restaurants and shops. Scalo is wonderful upscale dining. Zacateca has great tacos. Zinc Wine Bar is frequented by some film industry luminaries. Countless antique stores might provide a treasure or two. Good ol' Starbucks is just to the south on Washington and Lomas. Try Farina Pizzeria and Wine Bar downtown, too. Grocery, gas, pharmacy are all nearby on Carlisle. My favorite hikes start near the base of The Sandia Peak Tramway to the East (hills/views), or along the river starting from the Rio Grande Nature Center (flat/scenic) to the West.